Policies once seen as far-left enjoy broad support in polling. But Republicans who think they can use the proposals as a political weapon in 2020 to paint Democrats as wild-eyed, tax-and-spend liberals — a winning strategy since Walter Mondale called for higher taxes in 1984 and got crushed — may find it challenging. Historical trend data from Gallup show that the percentage of people describing their taxes as too high peaked around 1970 at 69 percent when the top marginal rate was around 70 percent, though the effective rate after deductions and other tax-avoidance strategies was much lower. Some Democrats piling into the 2020 race are now competing to get further to the left on boosting taxes on the rich. After Warren’s wealth tax announcement, likely candidate Sen. Bernie Sanders (I-Vt.), who bucked recent political tradition with calls for tax hikes in his 2016 campaign, unveiled a proposal to increase the number of wealthy Americans subject to the estate tax. Those who aren’t calling for big new taxes — including Sen. Kamala Harris (D-Calif.), who prefers refundable tax credits — are facing some heat on the left as insufficiently progressive. 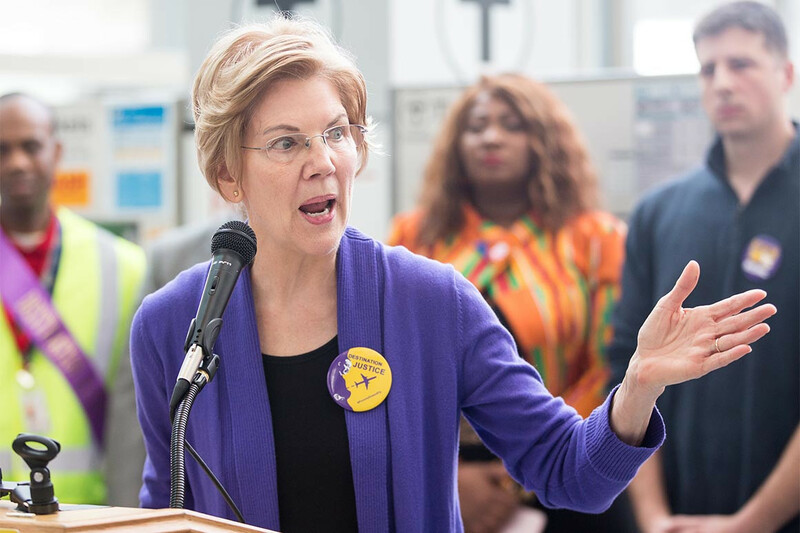 In an interview, Warren said polling numbers suggesting fairly wide public support for plans like hers to tax the rich did not come as any shock. In 2016, then-candidate Donald Trump tapped into the populist moment by railing against Wall Street and promising to deliver blue-collar manufacturing jobs back to the industrial Midwest. He also has a history with the idea of a wealth tax. In 1999, while contemplating a presidential bid on the Reform Party ticket, Trump proposed a one-time 14.25 percent tax on those with over $10 million in wealth in order to entirely wipe out the national debt. "By my calculations, 1 percent of Americans, who control 90 percent of the wealth in this country, would be affected by my plan,” Trump said at the time, sounding very much like Warren does today. Trump has long since abandoned that idea, focusing instead on wedge issues like immigration to target voters concerned about their jobs and wages as well as those worried about demographic changes in the country. But he may have vulnerability on the tax issue heading into 2020 given his biggest legislative accomplishment as president so far was a $2 trillion tax cut that showered most of its benefits on corporate America while offering much smaller reductions to middle-class taxpayers. Republicans believe the plan will ultimately lead to consistently faster growth and higher wages. But for now, polls consistently show the tax cut faring poorly. The latest POLITICO/Morning Consult poll found that 33 percent said the bill helped the economy, 41 percent said it hurt or made no difference and 25 percent said they didn’t know or had no opinion. Also in the poll, 65 percent said the nation was on the wrong track and 56 percent disapproved of Trump’s job as president. The top issue for voters in the poll was the economy, including taxes, wages, unemployment and spending, with 27 percent citing it as their top concern. Security issues, including the border, came in second at 23 percent. Republicans are watching the rising support for dramatically higher taxes on the wealthy with some concern, given their brand for decades has been around slashing taxes and reducing the role of government. Cembalest said he takes no position on the wisdom of the Warren or Ocasio-Cortez proposals. And he acknowledged the rise of inequality. But he said it’s important to note it’s not true that taxes now are dramatically lower than in the pre-Reagan years when the marginal rate was as high as 94 percent. Using “effective tax rates” calculated by the CBO, he said the percentage of income paid by the top 1 percent of earners right now is not much different than it was in the 1970s.